I was visiting with friends in Miami, Florida. 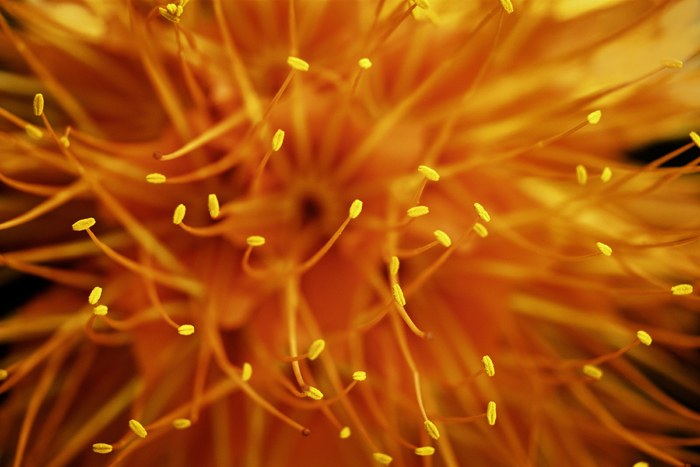 During a visit to a subtropical botanical garden I noticed a tree with huge orange flowers. Each one must have measured at least six inches across. Although this image has the appearance of macro photography, it was actually created with a telephoto lens. I shot with a very wide aperture to blur most of the flower’s features. Rather than seeking to record the physical reality of the flower, I wanted to express the experience of its color and texture. The stamens look very active to me. 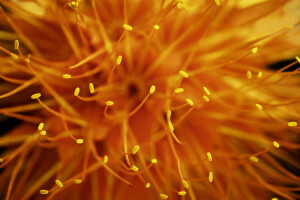 The whole interior of the flower seems kind of like a Fourth of July fireworks display. I love the suggestion of explosive motion.